This is Seahawks general manager John Schneider doing his best "Drunk Guy Who Has Been at the Party For Way Too Long" impression after his team's Super Bowl victory. Earl Thomas posted the picture to his Instagram account a few minutes ago before quickly deleting it. 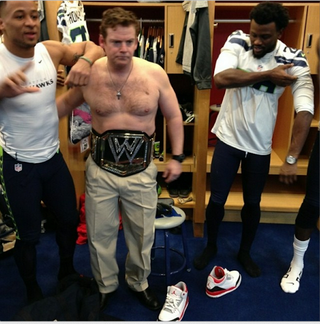 If the Seahawks or Schneider are ashamed of this picture, they shouldn't be. If you can't take your shirt off and slap a WWE championship belt around your waist after winning the Super Bowl, then what the hell is even the point of running an NFL team?